Native Bats are largely dependent on forests as a habitat. Female colonies raise their young inside the hollows of old trees. The males inhabit narrow crevices on their own, and in autumn lure the females to their mating roosts. 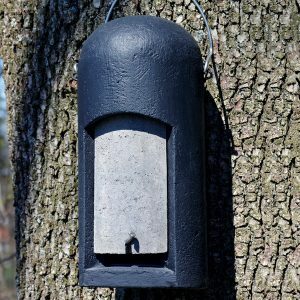 It is typical for all Bats to frequently move from one roost to another, and this means they require a large number of suitable tree hollows and crevices. However, in our forests ideal retreats are scarce. The additional entrance hole in the front also makes it easy for young animals to get into the cavity. In the upper area there is a hole which connects the chambers. 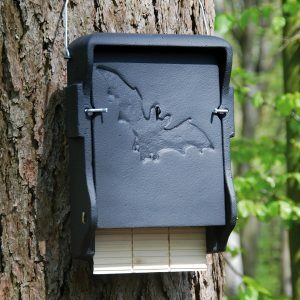 Summer roost The universal box is an ideal retreat for all Bats inhabiting forests. The innovative interior design of both roosting areas provides the Bats with an ideal climate from early summer to late autumn. 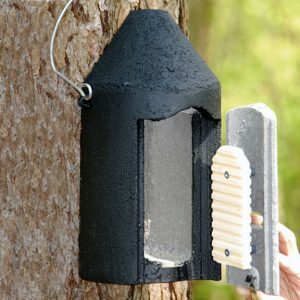 The rear compartment is perfectly designed for larger species and is sufficiently large for female colonies and their young, as well as for groups of mating Common Noctules. Species inhabiting crevices, such as Nathusius’s Pipistrelle and Natterer’s Bat, can use the small cavities of the forward compartment as a safe daytime sleeping area. The narrow entrance hole provides sleeping Bats with extra protection against predators and disturbances. The universal box is also self-cleaning and maintenance-free. Both daytime sleeping areas feature clinging surfaces made of untreated wood, and quality SCHWEGLER wood-concrete. The grooved design makes it possible even for younger, less adept animals to safely cling to the walls. The inside ceiling height is suited to the needs of more than ten species of Bat inhabiting forests. 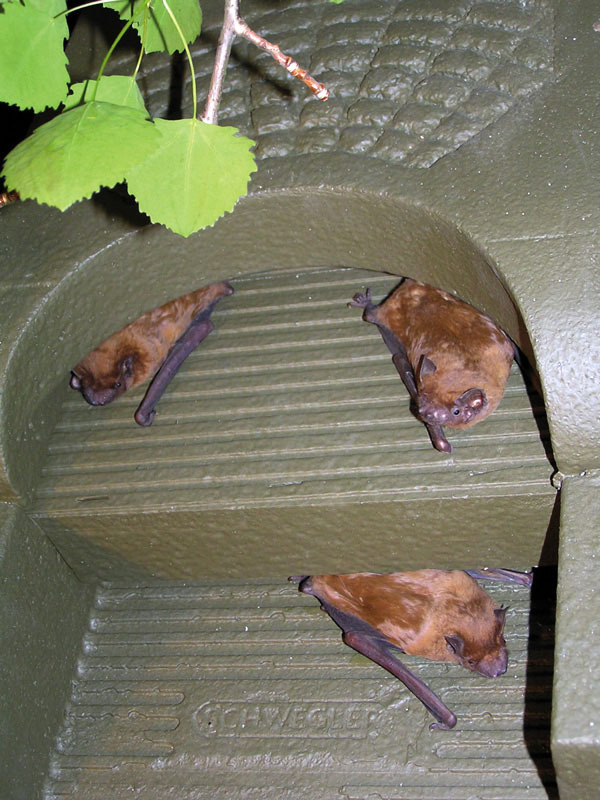 Whenever the weather changes the Bats can choose a sleeping area which offers them the best possible ambient climate. Materials: Weather-resistant, breathable SCHWEGLER wood-concrete. Clinging surfaces made of untreated, durable wood. Stainless steel mounting bracket. Where to install: Trees, masts, raised hides. 4 supports built into the semi-circular rear surface ensure the universal box is stable, safe and secure in windy weather. Best installed at 3 to 5 metres above ground. Bats need numerous roosts and retreats at all times. Even colonies move to different roosts after a few days, sometimes even daily. 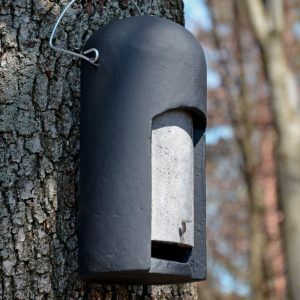 It is possible to install groups of Bat Boxes of any type, thereby increasing the likelihood of inhabitation and ensuring their long-term use. Bats prefer the flight paths to their roosts to be unobstructed. This will reduce the time it takes for a box to be inhabited. Cleaning and checking the box: Self-cleaning and maintenance-free. Use a torch or mirror on the underside of the box to check whether the box is inhabited. The universal box cannot be opened. Interior of the box: 2 separate compartments with clinging surfaces, for Bats inhabiting crevices and tree hollows. Dimensions: 20 cm wide, 74 cm and 64 cm high, narrow entrance hole for protection against predators. External dimensions: approx. W 24.5 cm x H 87.5 cm x D 19 cm. 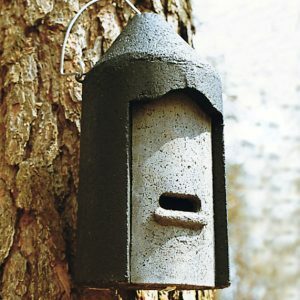 Includes: Nest box, stainless steel hanger and aluminium nail. 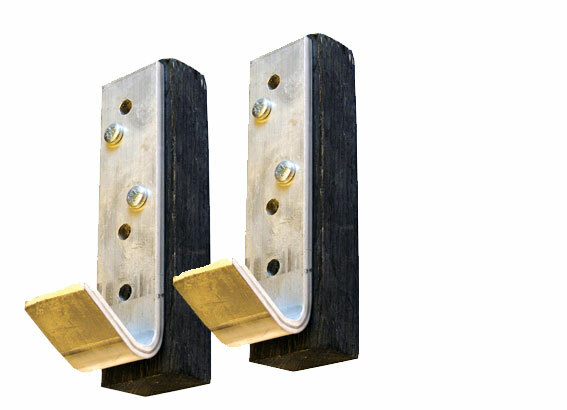 » ACCESSORY: Optionally, the 1FFH can be attached using two Hanging Blocks. Scope of delivery: 1 block + 3 aluminium nails.